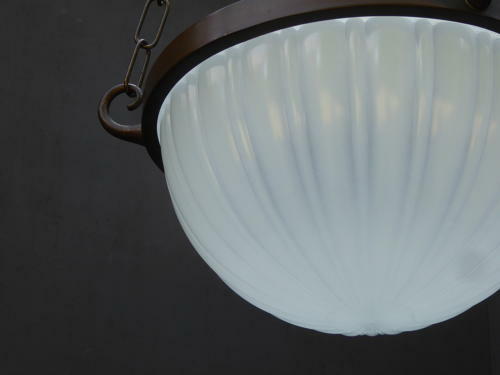 A beautiful antique moonstone glass plafonnier. A simple yet elegant piece, the heavy fluted opaque glass shade supported by its original copper gallery with a wonderful untouched patina. The moonstone shade boasts a robust nature yet delicate appearance & emits a beautifu, unrivalled glow once lit. The light comes ready to install with matched hanging chains, a three-way ceiling suspension hook & a brass bulb holder with a generous length of twisted flex. Wear commensurate with age, The shade shade has the usual minor nibbles caround the top rim, all of which hidden from view by the gallery & can't be seen. The light and gellery are both period, the chains & hanging hook are contemporary. The light currently has a drop of around 70cm & including the chains though the chains can easily be shortened. The measurements above include the gallery, the glass alone measures 25.5cm across & the light excluding the chains is 17cm deep. We recommend all electrical items should be checked and/or installed by a qualified electrician prior to use. UK courier service available at £15 tracked & signed for 24 hour delivery.